Properly functioning plumbing and appliances is a basic requirement for any home, business, or commercial establishment. Repairs, renovations, maintenance and installations need to be made periodically in order to avoid having a broken plumbing system. 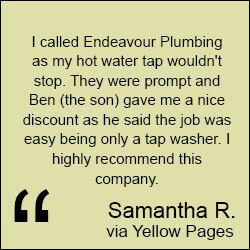 This is where Endeavour Plumbing Can Help. Our team at Endeavor Plumbing specialises in the maintenance and repair of all aspects of plumbing systems. We have worked with gas hot water systems, leaking pipes, drain blockage, among many other plumbing complications. We always do our best to present our Toorak customers with the best results, ensuring that their systems and appliances will be left in better working condition than ever before. Endeavor Plumbing is made up of a team of reliable experts that work persistently to resolve the issues our clients are facing. We carefully examine the problems present, and proceed to make educated decisions as to how to fix them. No matter how complicated or difficult, we will focus all of our efforts into making sure that your needs are met and that your expectations as our customer are surpassed. Our services are available 24/7, so even if an emergency arises at the most inconvenient of times, we are more than able to assist you. If you are in need of plumbing services in Toorak, give us a call or contact us through our website. We will respond to your needs and requests promptly. If you live in the Toorak area and require plumbing services, contact us through our Contact page, or via telephone. We will respond to your requests as soon as we can. The map below shows the service areas Endeavour plumbing offers in Toorak, Victoria. For emergency plumbing services in the below service area in Toorak, call us. We also provide plumbing services in Metro and surrounding suburbs such as our plumbing services in East Melbourne, if you're looking for the quickest service speak to our expert plumbers today.